There seems to have been a resurgence in the use of rubber hose animation. First, we had Cuphead come along and cartoonishly beat us all over the head with a hilarious comedy mallet. Now we’ve got Bendy and the Ink Machine, a game that just goes to show that early animation was completely terrifying. 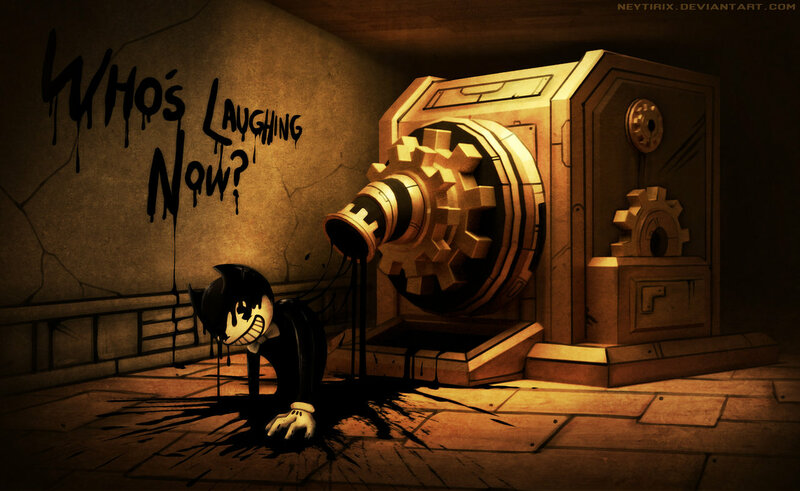 Bendy and the Ink Machine is a survival horror game originally released episodically by theMeatly Games, Ltd. and now published by Rooster Teeth Games for the console ports. It’s a first-person exploration horror game set in a long abandoned cartoon studio that the main character used to work in. 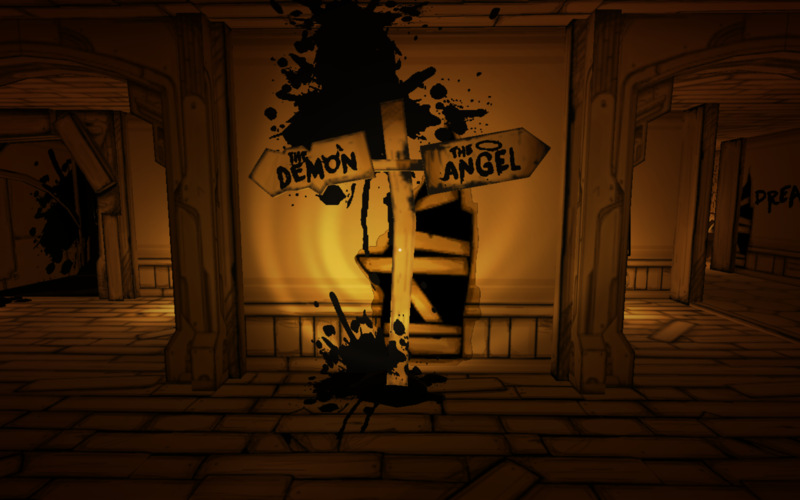 In Bendy and the Ink Machine, you are pursued by the titular Bendy, a monstrous living cartoon forced into the real world by the powerful ink machine. Trapped in the very building you used to work in, you must avoid the evil Bendy and find a way to escape the studio. 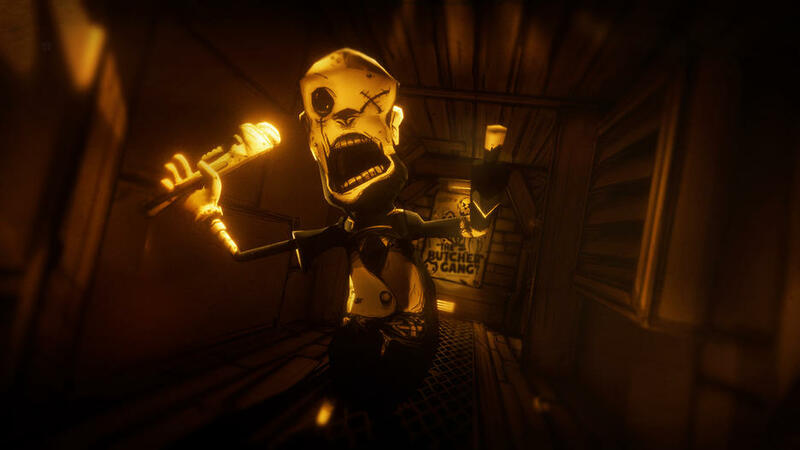 The style of gameplay in Bendy and the Ink Machine is somewhat similar to other first-person horror games, like the Amnesia series. You wander through an abandoned building, solving puzzles and avoiding monsters while trying not to have a real life heart attack. The biggest draw that Bendy and the Ink Machine has going for it, at least from a horror perspective, is the atmosphere. It is downright creepy at the best of times, oozing atmosphere as you explore an eerie, abandoned building dripping with strange, dark liquid. It really does send a shiver through your spine, and sometimes it can be hard to force yourself to continue. That’s not to say that the feeling is a bad one. In a horror game, the difficulty you have with forcing yourself to play it is basically an acid test for how effective it is. The environment is dark and filled with the constant threat of danger. Meanwhile, you have to try your best to focus on solving whatever puzzle or task you’re currently engaged in. It all comes together to make a thrilling, if intense, experience. Atmosphere aside, the actual gameplay mechanics in Bendy and the Ink Machine aren’t anything we haven’t seen before. You can run, you can interact with things in the environment and you can swing a weapon if and when you have one to use. Most of your time is spent switching between solving puzzles to progress, hiding from monsters or trying to beat them up if you have something to do it with. Again, the fact that the mechanics aren’t new doesn’t mean that they’re bad. The puzzles are well put together, and the sections where you’re forced to sneak around enemies are some of the most intense in the game. The combat suffers a little due to some badly designed hit boxes on the enemies, however. In fact, you can be almost inside of an enemy and still entirely unable to hit them. It is due to the lacklustre combat that Bendy and the Ink Machine has any annoying or dull moments at all. In the early chapters, you get into combat very infrequently and only use weapons to break through barriers. As time goes by, you end up having to fight more and more, culminating in a literal battle during the fifth chapter. Fortunately, these moments aren’t so frequent as to completely ruin the game, and you very quickly tend to get back to something more spooky and suspenseful. Because Bendy and the Ink Machine was initially an episodic game, the chapters are a little uneven. Chapters 1 & 2 are both pretty short, in fact, you can complete them both in under an hour. Chapters 3 & 4 are considerably longer and more complicated, both having multiple goals and taking nearly an hour each to complete. The final chapter returns back to the trend set by the first 2 and is relatively short again. All in all, this doesn’t affect the experience too much, but it might throw you off when trying to figure out how long you have left. Overall, it takes around 4 hours to finish the whole game, assuming you’re not going for 100% completion. Bendy and the Ink Machine has a fair amount of replay value, firstly because as you’re going through the game, there are certain things to collect, like cans of soup and audio logs. The soup is both a collectible and a health power-up for when you get damaged, but the audio logs are arguably more interesting. The logs give you a lot of background information about the story and are really necessary to fully understand everything that is going on. 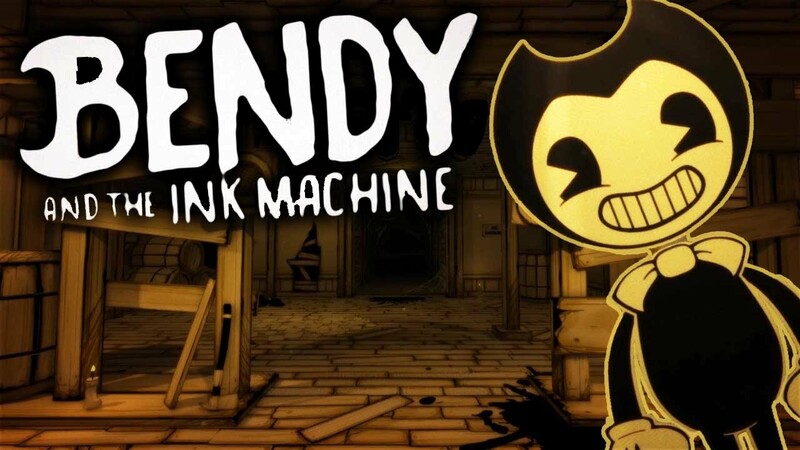 Without the extra information gained by a second playthrough of the game, the story of Bendy and the Ink Machine might leave the player feeling a little cold. It’s difficult to talk about without bringing up spoilers, but it’s important to remember that players will need at least 2 playthroughs to get the full experience of the story. Bendy and the Ink Machine also has a striking visual style. The game obviously features a lot of vintage cartoons, and these elements have also affected the environment design. The entire game is presented in a sepia-like tone, excluding a single scene at the end of the game. There are also sketch lines, ink splotches and graffiti all over the walls. 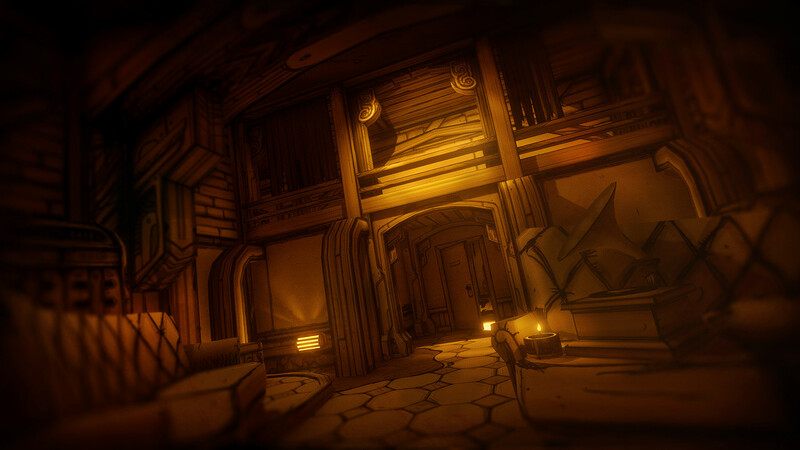 The world of Bendy looks exactly like you’d imagine an abandoned building filled with living cartoons would look like. There really is only one major fault with Bendy and the Ink Machine that has any major effect on the experience on console. 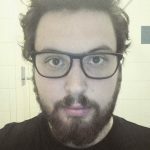 There is supposed to be a bonus chapter at the end of the game called The Archives. 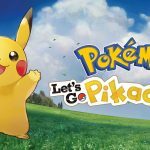 The Archives apparently contain a bunch of information about the story and possibly about the making of the game as well. The reason that we have to say apparently is because, at least on Xbox One, the last chapter is completely broken. If you try to start it, the game never stops loading, which is a real shame since that extra story information could bring everything together nicely. Despite its flaws and annoyances, Bendy and the Ink Machine is an absolutely amazing horror game that sort of came out of nowhere. Its style is distinctive, and the story is deeply interesting, even if the ending will leave some people wanting more. The combat might be a pain, but it’s pretty infrequent when compared with the number of times the player has to sneak or avoid enemies. It is creepy, intense and deeply disturbing and will leave you freaked the hell out. In short: It’s amazing. Bendy and the Ink Machine is a slightly flawed game that otherwise provides the player with an amazing horror experience. The atmosphere is intense and creepy, keeping you on your toes as you try to make your way through an abandoned location teaming with danger. It actually makes you scared to keep playing and knows the value of a good build up and execution. While the combat is annoying and gets overdone in later chapters, it's never so present that it completely wrecks the game, and overall there's a good mix between sneaking and fighting.